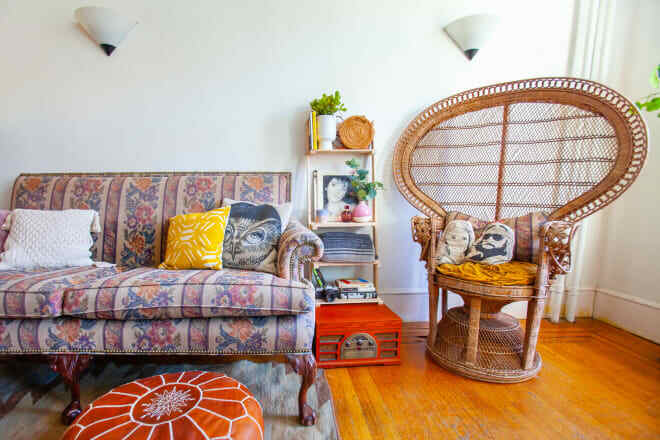 Amanda lives in a quaint 450-square-foot apartment in Queen Village with her cat Bug. Her day job is at Bluecadet Interactive in Fishtown, where she’s surrounded by positive, creative people. An artist herself, Amanda has found decorating her home to be a great outlet for her creative energy; most of the brightly colored interior paintings scattered throughout the space are her own. Fishtown is one of Philadelphia’s many booming neighborhoods, and it’s becoming increasingly difficult to find a unique (and affordable!) home in the area. When you’re as creative as Jessie and Deanna, settling for a typical white-wall one-bedroom isn’t the ideal. The two were thrilled when a photographer friend of theirs had a vacant loft in his restored and renovated Fishtown church. What’s better than 15-foot windows, stained glass, and original pews throughout your home to give a sense of irreplaceable character? After living in Philadelphia for over six years, Stephen and Amy bought their first home together in the city’s Fishtown neighborhood in 2013. Fishtown, a classic working-class neighborhood in Philadelphia, is named for its history in the shad fishing industry. It is home to many restaurants, cafes, and breweries, including the notable Philadelphia Brewing Company and Stephen Starr’s beer garden, Frankford Hall. It’s the perfect neighborhood if you long for the small town feel in a big city. Philadelphia-based designer and illustrator Alisa Wismer has discovered the perfect living and working setup for where’s she’s at in her career. “I actually live at home (you’re thinking, ‘Typical millennial,’ right? ), but it makes sense for where I’m at right now,” she says. “My parents have been super supportive in my decision to work for myself while I try to build my own business up.” She creates her illustration and stationery work—as well as graphic design, branding and web design for clients—from a teeny but bright 90-square-foot spare room. It’s the perfect example of how a small home office can be a motivating and inspiring space. Bre lives in one of those mythic apartments with rent so reasonable, you wonder if the landlord is independently wealthy. A red brick wall and big working fireplace will give you architecture envy. The house next door has an outdoor cat named “Mista Don’t Play” that will invite himself inside if you open a window on a summer day. I’m not from Philly, but Bre’s apartment is in a neighborhood that seems pretty common in mid-Atlantic cities: blocks of humble historic brick row houses mixed with newer buildings, indicating that the neighborhood’s dynamic might soon be changing. Parking on the street will be scarce in a few years, but for now it’s a breeze. And one thing’s for sure, Bre is making the most of her time while she’s here. Rachael and Rob’s first house wasn’t their “dream home” when they bought it five years ago, right before their wedding. But with a giant yard in the city and an open floor plan on a corner in a neighborhood they loved, it had enough potential to be pretty darn close. The biggest issue was it needed work after sitting vacant for a few years. A longtime friend of the couple, Will Stichter of HYMY Industries, helped remodel their open-air kitchen to be the entertaining oasis it is now. And after two years of work — and a cabinet or two falling off the wall (breaking every piece of china they owned) — the remodel was finished. What started out as a not-quite-a-dream-home is now a dreamy home perfect for the couple and their young daughter Frankie. Name: John and Melissa. Kids: Elliott and Julian. Dogs: Beatrix (Boston) and Bacon (Frenchie). This 1800-square-foot Philadelphia row home was just a shell when Melissa and John bought it two and a half years ago. On a tight budget, they applied for a special first-time home buyer loan to allow them to rehab the existing structure. They worked closely with a contractor, consultant and architect to create their dream home (as well as did a lot of the work themselves or with the help of friends). It was a true labor of love and a practice in patience; it took Melissa and John about two years to get the house to where it is today.